This December, every major studio is coming out with a film. Disney with Mary Poppins Returns, Sony with Spider-Man: Into The Spider-Verse, Universal with Mortal Engines, Paramount with Bumblebee and Warner Bros. with Aquaman. 20th Century Fox however will be rereleasing Deadpool 2, but not in the tradition sense. Here are five things to know about Once Upon a Deadpool. 1. The film opens in Standard 2D on Wednesday, December 12th, with opening night shows on Tuesday, December 11th starting at 7PM. Tickets are now available. Yes, you can get a discount Tuesday ticket for opening night. 2. In total, the film is mere seconds shorter than Deadpool 2. Including credits, Once Upon a Deadpool is 1 hour, 58 minutes and 58 seconds long. That’s exactly 14 seconds shorter than the theatrical runtime of Deadpool 2. However, Once Upon a Deadpool cuts to its mid-credits at 1:46:50 whereas Deadpool 2 cut to mid-credits at 1:49:22. That makes Once Upon a Deadpool 2 minutes and 33 second shorter when excluding credits. 3. The film includes 20 minutes of new footage. While the film rarely omits a scene from Deadpool 2, when it does it cuts to Fred Savage and Deadpool. That makes for some new comedic gags between the two. In addition to scenes between Wade and Savage, the film also includes other new jokes spread throughout the film. 4. For every ticket sold in the U.S. between December 12th to 24th, Fox promised to donate $1 to Fudge Cancer, a LA based charity. This was one of the requirements by Ryan Reynolds for making a PG-13 Deadpool movie. The other one was kidnapping Fred Savage. If you’d like to donate to Fudge Cancer on your own, you can do so on their website. 5. A fan on twitter had the idea earlier, but he and Reynolds worked it out. Michael Bramley tweeted a proposed PG-13 spin on Deadpool starring Fred Savage and parodying The Princess Bride back in December 2017. After that was reported, Reynolds reached out to Bramley. They spoke and came to the conclusion that the situation was a giant coincidence. Bramley is looking forward to the film and is excited over people being able to enjoy the concept and it raising money for charity. He did however ask Reynolds to sign a photo of Fred Savage. 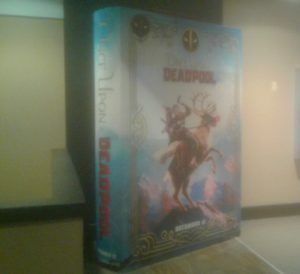 A standee promoting “Once Upon a Deadpool” at Cinepolis Chelsea in New York.